What does Nicola Sturgeon, First Minister, do all day? Tweet a bit about the books she likes, post some pix of Ailsa Craig, make the odd part-speech about, say, gender (in)equality, welcome a few jobs announcements, denounce the Tories and Corbyn. And then…? In recent weeks we have heard nary a word about the defining issue of UK and Scottish politics: Brexit. At most, perhaps, a couple of acid phrases on Theresa May’s Chequers “plan” unravelling but on the momentum building up behind a People’s Vote or second EU referendum nothing. Silent. Our colleague Kirsty Hughes of the Scottish Centre on European Relations has cited senior Scottish Government officials dealing with the EU as calling this approach: “strategic passivity.” Or inactivity. Aka doing nothing. This “strategic passivity” is across-the-board when it comes to policy-making. John Swinney’s ‘Great Education Reform Bill’ has been dumped as it would never get through Holyrood when ending inequality in educational outcomes (attainment levels) was once the defining goal and passion of this third SNP administration. The Growth Commission has reported and been shredded economically, including by pro-independence commentators/experts. A fairly dramatic Cabinet reshuffle on paper has produced a mouse. Maybe the summer heat and hols have been responsible for this policy torpor. But the Government is inert. Perhaps the First Minister is aping a former model, Angela Merkel, whose (once) highly successful approach was: Aussitzen. (Sitting it out). Are we and she waiting until the Supreme Court rules on the Continuity Bill (or Westminster power grab) in October? Or the key European Council (EU summit) in the middle of the same month? Or the SNP annual conference in Glasgow (October 7-9) before these two? Or is there more to it than this? “Once we get some clarity, which hopefully we will in autumn of this year, about the Brexit outcome and the future relationship between the U.K and the EU, then I will consider again the question of the timing of an independence referendum,” she told ITV’s Peston on Sunday in late May. This may be putting the cart before the horse given that May could be a goner by then and/or a general election in the offing – or the Prime Minister may have achieved an improbable success in her hands-on negotiations with Barnier and the EU-27. None of us has a clue whether and what this might be. All we know about the Scottish Government position is that Sturgeon wants the UK to stay in the single market and customs union: a so-called soft Brexit and/or Norway-style arrangement that is so excoriated by Boris, Jacob and their gang and, we now know, the ageing chairs of moribund Conservative constituency associations in the English shires it may well flop. It’s far from clear where the First Minister stands on a second EU referendum. Her Brexit minister Mike Russell favours one but Sturgeon has so far ignored the clamour. 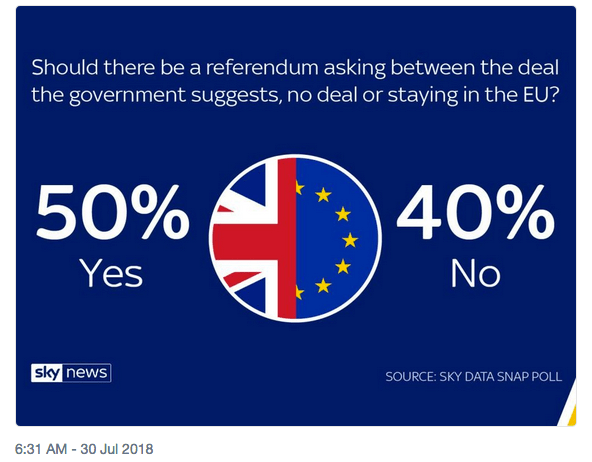 Yet a People’s Vote reflects the continuing pro-Remain majority in Scotland and, on current polling, would deliver a similar majority UK-wide. Is this the source of the First Minister’s “strategic passivity” on the EU/Brexit issue? Bluntly: would an end to the Article 50 exit negotiations and continued EU membership for the entire UK scupper Sturgeon’s plans for a second Scottish independence referendum (#indyref2) by reasserting the value or at least continuity of the unitary UK state? In a (admittedly volatile) environment where pro-independence sentiment is far from secure/stable. Or: does she hope that the Supreme Court, that has already undermined the Sewel Convention, will go further and, by backing the UK Government, wreck the 20-year-old devolution settlement, thereby unleashing an unstoppable wave of pro-independence feeling among angry Scots? Leading to the long-heralded Break-up of Britain (H/T Tom Nairn, 1977/1981). When combined with a No Deal outcome in Brussels between October 2018 and March 2019 (ostensible date of UK departure from the EU) this extraordinary period of political instability would inevitably trigger a crisis on the foreign exchange and financial markets, sending the UK economy into a proverbial tailspin. Would this alone prompt Sturgeon to call a second referendum before the economic damage gets too bad? Or, rather, would she prefer the post-Brexit ravages to be so profound by, say, 2021 that independence (for a shrivelled economy) would fall into her lap? We don’t know because she won’t say. But this “strategic passivity” is already causing economic and social damage. Nicola Sturgeon has a great opportunity to reassert her leadership qualities and political foresightedness by seizing the day and driving forward the People’s Vote campaign. A UK-wide decision to Remain after all would not paralyse/reverse the momentum for Scottish independence, some commentators assert. Certainly, the tawdry displays of English chauvinism, the ugly racist sentiments behind it, the Dad’s Army nostalgia for empire, quite apart from the liars and cheats that delivered Leave, are reason enough to stay in (and reform) Europe – and quit the rotting ship of the British unitary state before it’s too late. David – leaving aside some of your politician bias (which, alas, shines through your piece), you are right, in my view, to encourage the SNP/pro-indy majority in Holyrood to take control of matters one way or the other. It’s a mess and it will not stop for soem time, so assert authority and drive clearly to a destination. Using Brexit, in whichever shape it takes, as the trigger for indyref2 is opportunistic but understandable, and democratically mandated apart from anything else. Arguing and campaigning for a CU + SM or people’s referendum is, however, only consistent with a ‘purist’s’ form of nationalism with an indyref2 moment some time way off, i.e. nationalism for nationalism’s sake regardless of the circumstances. For NS, independence is more important than EU membership, a perfectly understandable position given who she is what she stands for. Does a People’s ref fit that? Not really. Any charge for the People’s ref would have to come with strings attached. Clear ones. Like, let’s make sure that the system that brought us Brexit no longer exists after the ref. Put on triple locks, make Holyrood constitutionally untouchable (from Lord Keen’s put-downs aside from anything else), give the Scottish Parliament more (un-returnable) powers, away with this Anglo-centric version of centralized power and quaint Parliamentary democracy. Do not, in other words, expect NS to lead on something which means reverting to the status quo, that humiliating circus of BoJos, Moggers, Mays, Goves and Corbyns with the devolved ‘nations’ (?) sidelined. There are many ways forward out of the nonsense that we (all) have to put up with daily. The current model is utterly indefensible – even Bernard Jenkins says as much. A root and branch review and amendment of the Treaty of Union, if such needs doing, could be a starting point but there is no credible political movement seeking that. The Lib Dems are puny and have shot their goose anyway having cohabited with the Conservatives and Labour desperate, it would appear, to have the UK all to itself in order to experiment Venezuala-style. The only viable, spoken-about option is independence, like it or not. In that, it is not clear how a 2nd People’s ref fits. If successful, we revert to the UK as it was with only the faintest of promises/pledges/vows/weasel words that things will definitely change (wheel out Gordon Brown et al). Yet we know it won’t really. If NS led the charge, and won on the People’s ref, would she get the credit? Would she be able to cash in a token and make demands short of indy? Why would she trust that to work and/or why would she pursue what her heart doesn’t wish? Which politicians at WM, which political parties aside from the Greens (1 MP), could she really trust in to do justice by Scotland (Wales and NI)? Which MPs/parties are offering that half way house option which keeps the vast, vast majority happy? None. The two biggies just don’t care about it. I see only one thing: NS setting a date or timeline for Indyref2 linked to brexit. But she’ll have to be bold, not timid as she was last year. I think you are right to say that Nicola appears to be uncertain about what to do next. The reasons are quite complex and are not necessarily to her discredit. One way to approach this is to look at her two jobs – First Minister and Leader of the SNP -which do not always pull in the same direction. She has always struck me as someone who realised sometime in 2014 that taking Scotland out of the UK was a practical nightmare though of course she would swear on the entire contents of a Christian bookshop that this was not true. As Leader of the SNP she has to respond to the fact that most of her party simply want to break up the UK regardless of the consequences and are getting impatient that the rapid progress towards that of the 2013 – 2016 period seems to have ground to a halt. As a genuine internationalist she was probably shocked by the result in the 2016 referendum and this re-awakened her Scottish nationalism. As we know that did not work out. On the other hand, Andrew Wilson’s genuine but unsuccessful attempt to wrestle with the economic realities of taking Scotland out of the UK has left only the fantasies of the far left or the purely symbolic nationalism of the flag wavers, both strong in the SNP, to sustain that nationalism. The best hope for Nicola’s vison of the SNP probably lies in using that party to give a powerful Scottish twist to the radical reform the UK needs. That depends on a successful Labour Party winning seats in the rest of the UK and the will of that party to do that seems to me to be in question at present. As far as Brexit is concerned there is every case for a referendum on the terms. These are likely to be very different from those promised in the first referendum campaign and , as First Minster, Nicola must see the force of this. As SNP Leader however, she knows that the terms for Scotland leaving the UK would also be nothing like those that would have to be promised to win another referendum in Scotland. The precedent of a second vote could be disastrous for this cause, as Jim Sillars pointed out recently. Nicola therefore has a genuine constitutional dilemma. What is more difficult to explain is the failure on purely domestic matters, particularly education. The best thing any political leader could do for Scotland would be to give it a world class school system and that is readily achievable without major constitutional reform or even spending a vast amount of money. The key lies in giving direct help to our teachers to do their job better and work more productively. It is not too late for Nicola to do that and to earn the lasting gratitude of the Scottish people whatever lies ahead on the constitution.